12.5" RCOS @ ~f/9 (2897 mm fl) 0.64 arcsec / pixel. The Zoomify image scale is 0.64 to 2.56 arcsec / pixel. CCDSoft, CCDStack, PixInsight, Photoshop CS3, Noel Carboni's actions. eXcalibrator for (u-g), (g-r) color calibration, using 7 stars from the SDSS-DR7 database. CCDStack to calibrate, register, normalize, data reject, combine the sub exposures & selective deconvolution. PixInsight for the LRGB combine, non-linear stretching and gradient removal. PhotoShop for final tweaks and background noise reduction with the Noiseware Pro plug-in. The Tadpole Galaxy is a disrupted barred spiral galaxy located 400 million light years from Earth toward the northern constellation Draco. 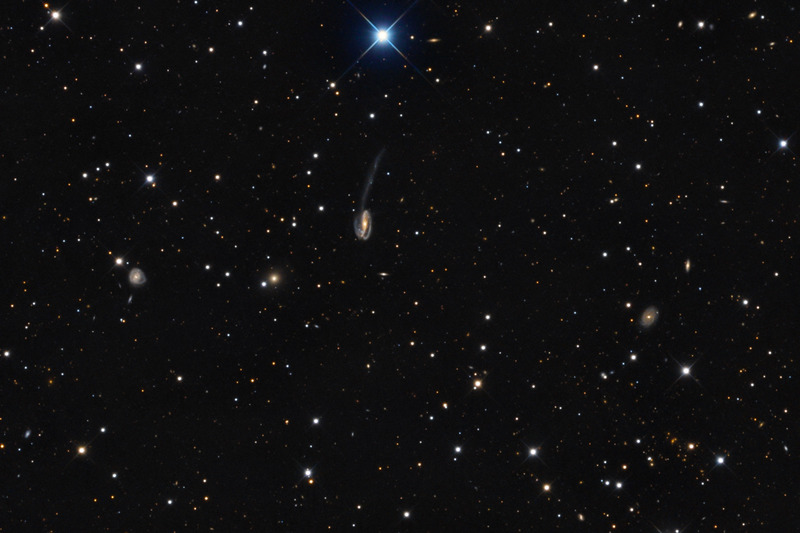 It is believed that a smaller galaxy crossed in front of the Tadpole and was then slung around behind. The strong tidal forces of this close encounter created the Tadpole's long tail. The tail is about 280 thousand light-years long and features massive bright blue star clusters. The tail is expected to eventually break up into small satellite galaxies.